In a letter addressed to Arizona's senate president and speaker of the house, NHL commissioner Gary Bettman has made it clear: The Arizona Coyotes cannot and will not remain in Glendale for the long term. In the letter dated Tuesday, Bettman told Arizona Senate President Steve Yarbrough and House Speaker J.D. Mesnard that the Coyotes' current arena situation in Glendale is "not economically capable of supporting a successful NHL franchise" and the team "must have a new arena location to succeed." Bettman's letter was delivered as the Senate continues to weigh SB 1149, which would pave the way for $395 million in funding for a new Coyotes arena in the Valley. The bill would require Coyotes ownership to contribute $170 million of that funding, while the host city would pay for $55 million and the remaining $170 million would come via sales taxes. In response to Bettman's letter, Mesnard said SB 1149 has a tough road ahead. "While I very much want to see the Coyotes remain in Arizona, what they're asking for is no small thing," Mesnard said in a statement. "The NHL first needs to make the case for a state-funded arena to the taxpayers. We're not seeing a lot of enthusiasm that the public wants to foot the bill for a new arena, and until the NHL can win over taxpayers, they're going to have a tough sell at the Legislature." Last month, SB 1149 made its way out of the Senate Transportation and Technology Committee. But it is reportedly facing tough opposition in the Senate as a whole, where it must be approved before it goes to a vote in the House. "The Greater Phoenix region represents a strong hockey market which we are proud to have included in the NHL. With that said, let me be abundantly clear: the Coyotes' current location in Glendale at Gila River Arena is not economically capable of supporting a successful NHL franchise," Bettman wrote in his letter. "For the past 15 years, a succession of ownership groups and the League have tried everything imaginable to make the Glendale location financially sustainable. Our combined efforts all have yielded the same result a consistent economic loss." "The simple truth? The Arizona Coyotes must have a new arena location to succeed. 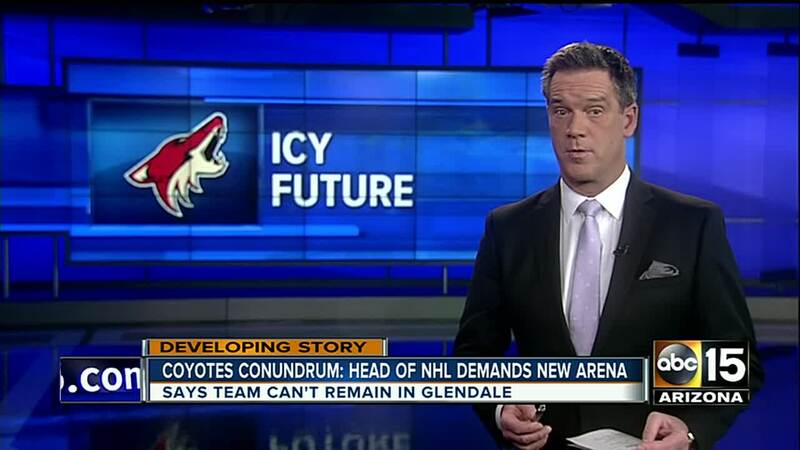 The Coyotes cannot and will not remain in Glendale." Bettman said SB 1149 "creates a path of success for the team, Coyotes fans, the state of Arizona and Arizona taxpayers" and "creates absolutely no financial risk or debt for the state, nor will it make use of any existing state tax dollars." Bettman cited an economic impact study that concluded SB 1149 would create over 2,500 new construction jobs and over 3,600 "direct and indirect jobs resulting from the arena's operation." According to Bettman, the total economic impact of a new arena would be over $600 million -- "meaning that a new arena in the East Valley or downtown Phoenix would nearly double the current positive impact that the team already brings to Arizona," and the tax revenue generated from the arena would exceed the state's current revenue. The Coyotes have played at Gila River Arena in Glendale since the 2003-04 season but made plans to leave Glendale after the team and the city renegotiated its arena lease due to legal differences. The lease is set to expire after the 2018-19 season, and the Coyotes had planned to begin play at a new arena beginning in 2019-20. "While the Coyotes ownership has consistently promised to explore every possible option to keep the franchise in Arizona, no business can afford to be in financial and marketing limbo," Bettman wrote. "And, please remember it was the City of Glendale -- not the Coyotes -- that terminated the long-term agreement it had with the Coyotes." On Nov. 14, the Coyotes announced plans to create a new arena venue with ASU on the site of the Karsten Golf Course in Tempe, on the northwest corner of McClintock Drive and Rio Salado Parkway, across the street from Tempe Marketplace. But on Feb. 3, ASU announced it had no intention of proceeding with those plans, leaving the Coyotes to renew their search for a new arena location. Other possible rumored locations for a new Coyotes' arena include Scottsdale at the Salt River Pima-Maricopa Indian Reservation; downtown Phoenix in a joint arena with the Phoenix Suns; and Mesa near the Chicago Cubs' spring training facility. "As Commissioner Bettman made clear in his letter to legislators, the Arizona Coyotes Hockey Club cannot survive in Glendale," Coyotes majority owner and chairman Andrew Barroway said in a statement. 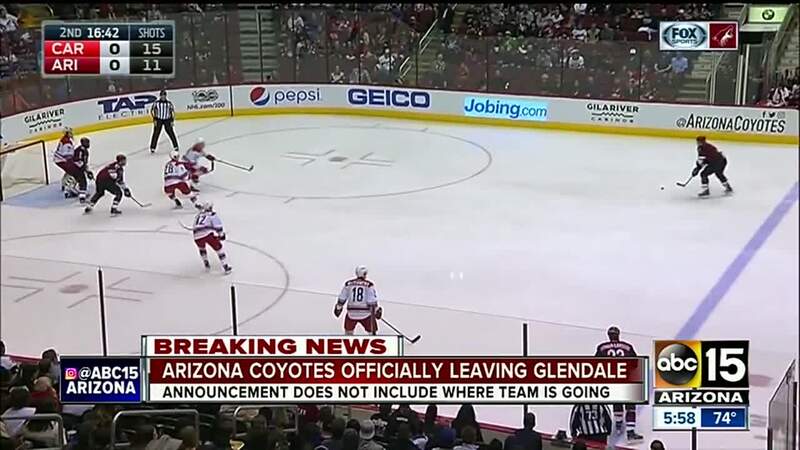 "The Glendale location is wrong -- both geographically and economically -- given its distance from much of the Coyotes' fan base and, in particular, premium ticketholders and corporate sponsors. "The bottom line remains the same: the team's owners continue to lose tens of millions of dollars annually. Consistent losses of such magnitude are not sustainable -- not for an NHL franchise, or any other business." Barroway reiterated Bettman's statement that a new Coyotes arena will create thousands of jobs and millions of dollars in new tax revenue for the state. "These funds can and will be deployed in our community, and will directly benefit Arizona residents," Barroway wrote. "These funds will also ensure the Coyotes' future in Arizona, and remove the uncertainty that has hovered over the franchise for many years. "The Coyotes are simply seeking to split the tax revenues generated from the arena district equally with the state. This legislation will not require taxpayers to contribute a penny to this project out of existing state tax dollars."